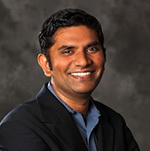 Bhaskar Krishnamachari is Professor and Ming Hsieh Faculty Fellow in Electrical Engineering at the Viterbi School of Engineering, University of Southern California. He received his B.E. in Electrical Engineering from The Cooper Union and his M.S. and Ph.D. in Electrical Engineering from Cornell University. He has been a faculty member in the Department of Electrical Engineering since 2002. He also holds a joint appointment in the Department of Computer Science. He is the Director of the Autonomous Networks Research Group, and Co-Director of the Ming Hsieh Institute. He has co-authored over 200 technical articles, including four that have received conference best-paper awards at ACM/IEEE IPSN (2004, 2010), ACM MSWiM (2006) and ACM MobiCom (2010), and one that received best-paper runner-up award at IEEE SECON (2012). Collectively his work has been cited more than 19,000 times (per Google Scholar). In 2015, Bhaskar Krishnamachari was listed in Popular Science Magazine's "Brilliant Ten" list; and in 2011, he was included in the TR-35 , Technology Review Magazine's annual listing of the top 35 young innovators under the age of 35. He has received the 2010 ASEE Terman Award, given annually to an electrical engineering educator, and the 2010 IEEE-HKN Outstanding Young Electrical and Computer Engineer Award. He has also received the USC-Mellon Award for Mentoring Graduate Students in 2008, the USC Viterbi School of Engineering Junior Faculty Research Award in 2005, and the National Science Foundation CAREER award in 2004. From 2005-2008, he held the Philip and Cayley MacDonald Early Career Endowed Chair at USC. He has served as an editor/associate editor for the ACM Transactions on Sensor Networks, IEEE Transactions on Wireless Communications, and the IEEE Transactions on Mobile Computing. He helped to compile and co-edit a Themed issue of the Philosophical Transactions of The Royal Society A on Sensor Network Algorithms and Applications, which appeared in January 2012 and also an issue on Learning-Based Decision Making in Dynamic Systems Under Uncertainty in the IEEE Journal of Special Topics in Signal Processing in October 2013. He is a founding editor of the IEEE JSAC special series on Green Communications and Networking. He has authored a textbook titled Networking Wireless Sensors, published by Cambridge University Press. Bhaskar Krishnamachari's research interests are focused on the design and analysis of algorithms, protocols, and applications for next generation wireless networks. These include low power wireless sensor networks and the Internet of Things, connected vehicles, robotic networks, cognitive radio networks, underwater networks, and green cellular networks. On these topics, his research spans the entire spectrum from theoretical analysis of algorithms to prototype software implementations of network protocols and applications. On the theoretical front, his research includes the development and application of tools from online learning, stochastic optimization and control, game theory, and combinatorial algorithms. On the practical front, his research group maintains and conducts experiments on Tutornet, a state of the art low power IoT testbed (see http://anrg.usc.edu/www/tutornet), and collaborates with researchers at GM working on connected vehicles.